Now available for purchase at Astrom Editions, Amazon.com, and Amazon.de. 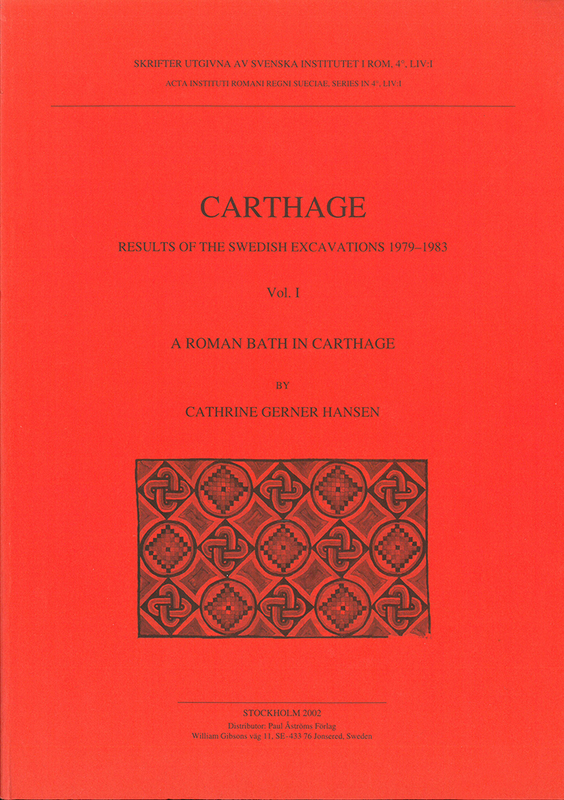 This volume contains the architectural descriptions and analyses of the ruin found by the Swedish Mission to Carthage, SMC, during 1979–1980 within the Unesco programme Pour Sauver Carthage. An archaeological report will follow. The main plot, Site A, which was placed at the disposition of the SMC is located at the foot of the northern incline of Byrsa in the triangle between avenue de la Republique (now avenue de I’ Amphitheatre) and rue Mendes France. Since the excavations were established on the highest point of the saddle between the two Carthaginian heights Byrsa and Juno it was entirely unexpected when the remains of a Roman bath complex were revealed. The finds essentially confirm Saumagne’s theories regarding the layout of Roman Carthage. The main and best preserved remains, labelled Complex II, were part of lnsula 101 E making up the corner between the Cardo I E and Decumanus I N. Approximately 620 m2 of the building, hypothetically dated to originate from the period between the middle of the 2nd and the end of the 5th century AD, were unearthed. It enclosed an eastern bath section ascribed to the original layout of the complex and a smaller western bath section belonging to a secondary phase. Besides the two hypocausts eight cisterns and over forty channels could be traced. When Complex II was constructed, this was accomplished without any regard for the earlier Complex I, which was demolished down to a level at which it could be hidden by the new building. Complex I is presumed to belong to the Augustan revival of the town. Few walls were found below the level of the paving of Complex II and they are insufficient to reveal the plan or functions of this complex. Traces of a grave and the bottom of a Punic cistern are the most convincing remains from the Punic period. These few traces also confirm the hypothesis that a transition of the area from necropolis to residential area took place in the 2nd century BC, leaving a very short period of existence for Punic habitation before the Roman conquest in 146 BC. Cathrine Gerner Hansen, Carthage. Results of the Swedish excavations 1979–1983. 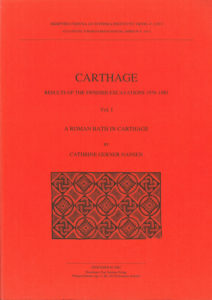 A Roman bath in Carthage, (Skrifter utgivna av Svenska Institutet i Rom, 4°, 54, vol. 1), Stockholm 2002. ISBN: 91-7042-158-7. Softcover: 130 pages & 8 fold-out plans. John Lund, Rita Larje & Harald Nilsson, Carthage II. The Swedish Mission to Carthage. Part of the UNESCO Project “Pour Sauver Carthage” (Skrifter utgivna av Svenska Institutet i Rom, 4°, 54, vol. 2), Stockholm 2017 . ISSN: 0081-993X. ISBN: 978-91-7042-158-7. Hardcover: 235 pages.